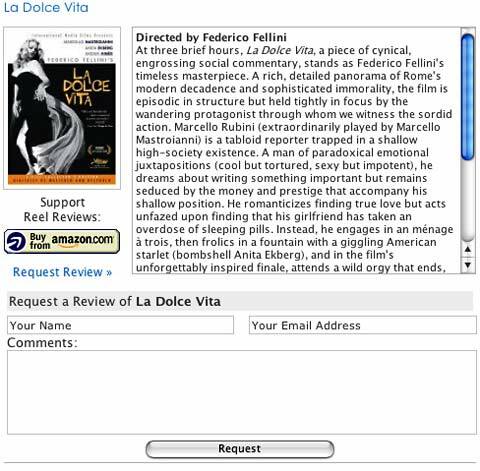 I have just turned on the newest feature at Reel Reviews in all its AJAX goodness: the DVD List. I am often asked whether or not I have a particular film, now people can check for themselves and request a Reel Review. 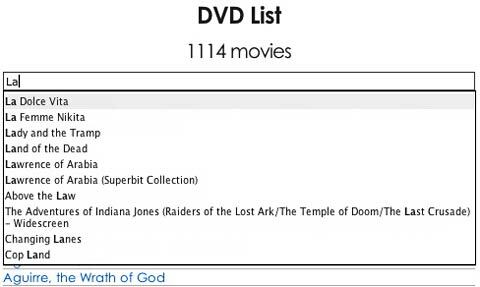 We have created a catalog section that lists all the DVDs in my collection. It allows visitors to browse the collection, purchase via Amazon (thanks for the support) but most importantly it lets people request a review. The review requests are tabulated and displayed in the admin panel. Here are some screenshots and explanations. 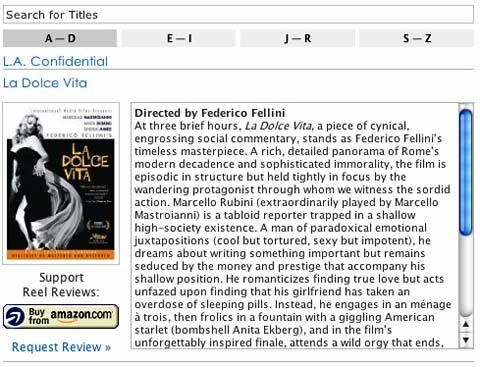 If you know the title of the film you are searching for you can use the “Live search” bar at the top which keeps populating with the search results that best match what you have entered. Once you select the film, this screen spawns itself. It includes the cover art (where available) and some general film information. It has an Amazon purchase option on the left. At the bottom left you can request a review. Once you select “Request Review” this box spawns. It asks for your name, email and any comments you may have on the review request. In the background, via the admin panel, the plugin tabulates the number of reviews for each title and gives me the contact info so I can continue the conversation with the requester. The entire application is new and has taken a lot of work. We are working the last few bugs out. Give it a spin, if you see something odd please let us know, what happened, how it happened and what browser you are using. I hope Reel Reviews fans find it useful. I have always wanted a way to display my whole DVD collection efficiently, I think we have finally built it. Try it out.